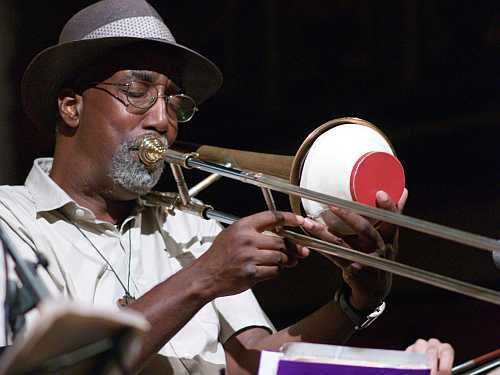 Charlie got to sit down with Trombonist Curtis Fowlkes at his home in Brooklyn. You guys may know Curtis as a member of The Jazz Passengers Curtis has also worked extensively with Charlie Haden , Charlie Hunter ( yes that Charlie Hunter! ), The Lounge Lizards , Bill Frisell , John Zorn, Marc Ribot , The Big Apple Circus , and as a member of the house band in Robert Altman’s “Kansas City”(Hal Willner anyone?) but that’s just the tip of the iceberg when it comes to Curtis. Curtis talks about growing up in Brooklyn in the 60’s and getting on the scene. Wynton Kelly played at his high school prom for example. That’s the Brooklyn we want to know about right? Just a great conversation between two obvious friends. Curtis is just such a great cat can’t say enough good stuff about him. We need WAY more people like Curtis in the music business. Enjoy. CLICK THE LINK BELOW TO HEAR THE CONVERSATION!